All of the Starbucks rumors are true this week. From the whopping $7 bucks you can now shell out for a cup of joe to the interesting new gift card, which, amazingly was designed, as far as we can tell, for the one percenters in the nation. That’s right, Starbucks has now, with a straight face, introduced the world to its version of the Visa Black Card. Except, it’s a gift card. And it’s not endorsed by Visa. And you can’t a take a vacation with it. It’s all about status, and to tell you the truth, I don’t know if I’d want to be seen with one of these. We agree with Blinkoff. Where is the common sense with these marketing folks? On what level is that OK? With this degree of silly materialistic waste, it’s difficult to even begin to understand the reasoning – if it was justified (and frankly, we’ve not heard any Starbucks folks defend it). Is it about bragging rights? Nah – not hardly. If you have money, your friends already know this because they’re probably jealous in this tough economy with high unemployment, new stories about fiscal cliff and a troubled stock market. They know you can afford whatever it is your heart desires – but please, do you really need to send the message to them that you had fifty extra bucks laying around and that you “invested” it in a stainless steel card that has no resale value at all (unless you reload the card, which, of course, defeats the purpose). It’s not collectible – maybe thirty years from now. And if you have money, you’re not heading to the local pawn shops, which, your broke friends are probably hoping you’ll do anyway just so they can catch the incredulous looks the pawn shop owner gives you when you march that thing up in there. Then again, they could catch it on video, upload it to YouTube and make a few dollars in ad revenue when it goes viral. Still, it’s not likely enough to pay the credit card bills or mortgage. Ah – but here’s where it gets good. You probably won’t find one. That’s not because everyone’s rushing out for them, but because there is a grand total of 5000 of them being manufactured. Oh – and don’t head off to your local Starbucks in search of one. They’re only found on one website for the elite, Gilt.com. 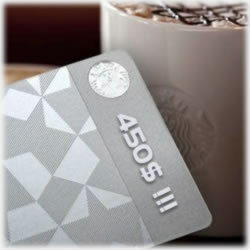 They’ll first be offered on Thursday to Starbucks rewards members. If there are any left, then the rest of us mere mortals can clamor the site for what’s left behind. Feel free to take your time – we’re in ho hurry to hit the site. While these exclusive gift cards are good for fodder, there are a few benefits to having them. Buying one puts you at Gold status in the famous rewards loyalty program Starbucks is so well known for. These rewards points are good for free goodies at any of its thousands of stores around the country and for swag on the Starbucks website. And, as we mentioned, the card is reloadable. Is it worth it? That’s up to you. Keep in mind, though, there are plenty of pretty impressive gift cards out there these days that won’t cost you an additional $50 just to own it. But if you do snag one of those costly gift cards, what we want to know is, will you be using it to buy Starbucks‘ new $7 cup of coffee? That’s right. Starbucks has debuted a $7 grande cup of coffee. Make no mistake – this is by far the most expensive joe the nation’s No. 1 coffeehouse has ever served. And if you’re wondering, a grande is 16 ounces. And if you’re thinking that $7 will buy you a Starbucks signature drink, think again. It buys you a plain-jane cup of joe. The Costa Rica Finca Palmilera coffee costs $40 for a half-pound bag and $6 for a 12-ounce ‘tall’ cup, Lisa Passe, a Starbucks spokeswoman, said in an e-mail to Bloomberg. It’s made from a rare, difficult-to-grow varietal called Geisha. Geisha is available only at 46 Starbucks in the Pacific Northwest, home of the nation’s leading aficionados. You can find it mostly in Seattle and Portland, Ore., and at one Idaho location. What’s the big deal? Geisha, named for an Ethiopian village where it was found, yields “a very small number of coffee cherries,” reads the Starbucks’ online store. It continues, “And the resulting beverage is described with a language most of us coffee yokels associate with wine”. Eh… tomatoe, tomato – it’s all the same to us. Seven bucks is still seven bucks and if you’re looking for perspective: look it at it as the interest on your credit card you could have paid had just brewed your own coffee at home before leaving the house. OK – so – you tell us. Is the stainless steel card worth having or is this just another shameless marketing ploy dreamt up by some marketing guru at the coffee house’s home office? Has Starbucks lost its edge? We want to hear from you and we also want to hear if you’ve had a cup of that $7 coffee, too. Good investment?